The Vintage Pattern wiki dates this one to 1943, smack-dab in the middle of World War II. Note the obligatory sign of manliness: Mr. A's pipe. Although additional research may reveal that the pattern companies limited their new style offerings during the War, I suspect that a large part of the pattern's appeal was its simplicity. 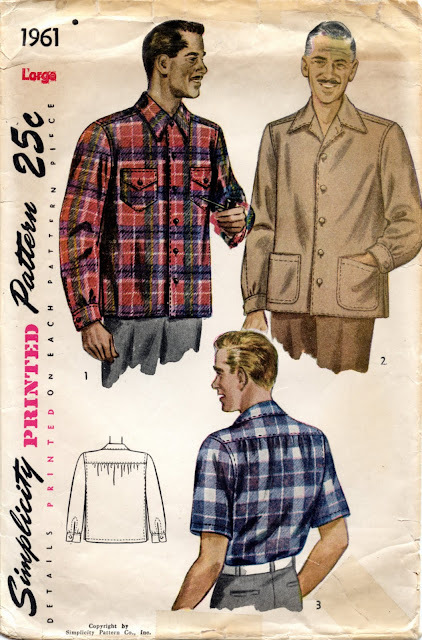 The front is simply turned under, rather than having a front placket. Plackets have also been eliminated from the sleeve openings, in favor of simple facings. 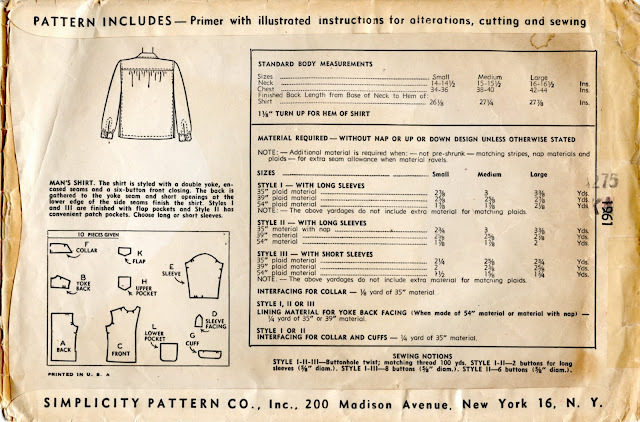 However, the maker of this pattern (or the gentleman) apparently preferred sleeves with plackets, because the sleeve facing piece hasn't been used, and included in the envelope are the placket and underlap pieces from a dress shirt pattern, McCall pattern 5864, along with a clipping from the pattern sheet showing how to apply these. The maker used only the upper pockets and flaps. Simplicity still assumes that the maker may not have a button hole attachment and that hand-worked button holes may be needed.